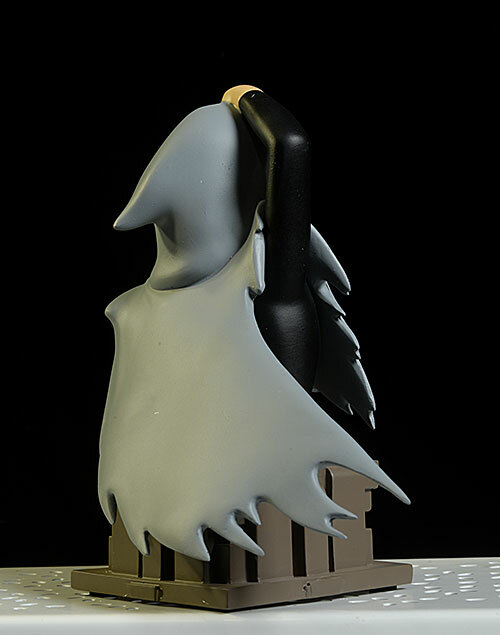 It looks like the terrific line of mini-busts developed by Diamond Select Toys based on the BTAS license is coming to an end. 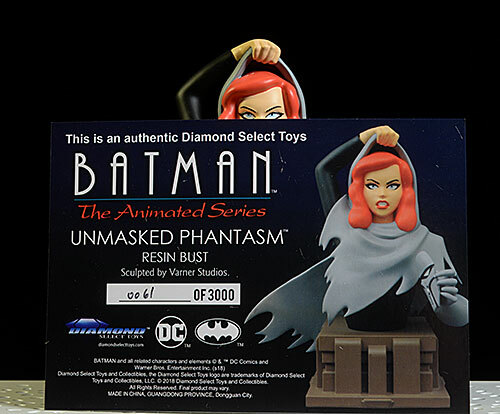 The latest release - the unmasked Phantasm - is the last one I've seen solicited, with no indication there will be more. I'm sad. 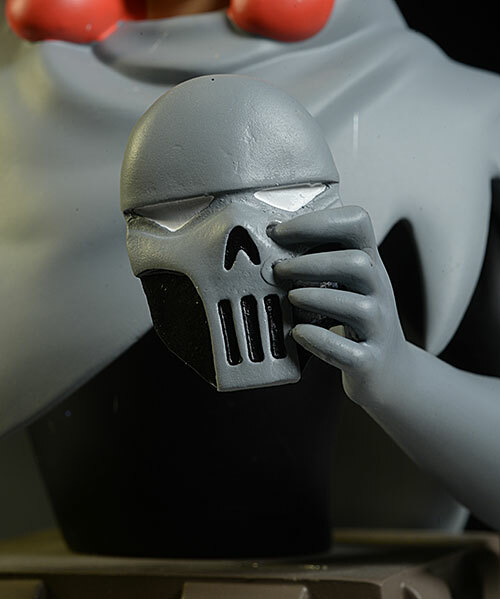 This final bust is the second Phantasm we've gotten in the series. 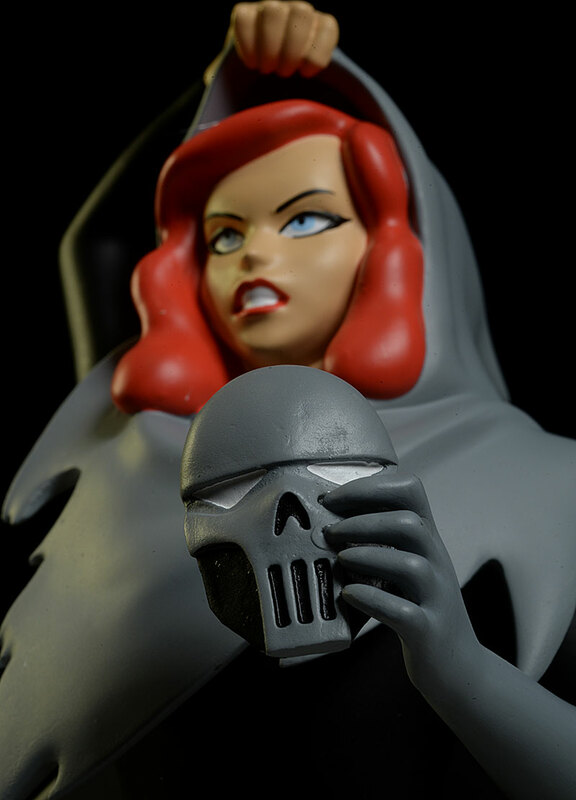 If you haven't watched the movie Mask of the Phantasm, well, I'm sorry to tell you this bust has just completely spoiled it for you, revealing who the bad guy - actually girl - really is. Then again, if you're a Batman fan and you don't know who the person under the mask is, you're going to be really shocked when you find out Vader is Luke's dad. 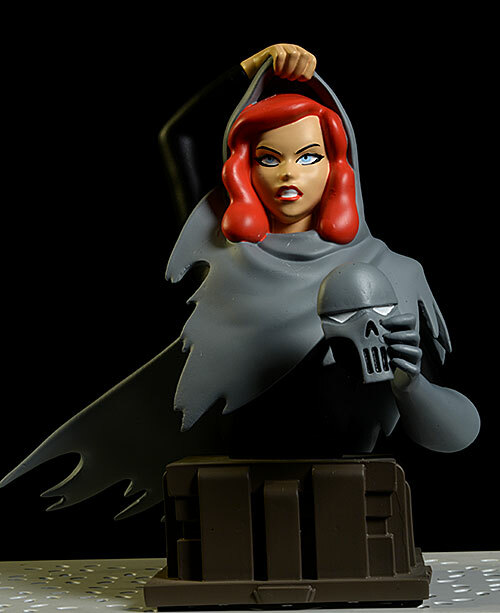 The bust is a limited edition of 3000, in line with the rest of the series, and sells for about $50 or so, depending on the retailer. Nothing super exciting, but like most bust boxes, it's collector friendly. I'm not a fan of the softer, less dense foam trays, but a plus is the edition size is printed on the bottom of the box, on the Certificate of Authenticity, and on the bottom of the statue itself. She's frozen mid-way during the big reveal, when audiences (at least the more gullible in the audience) inhaled with surprise. 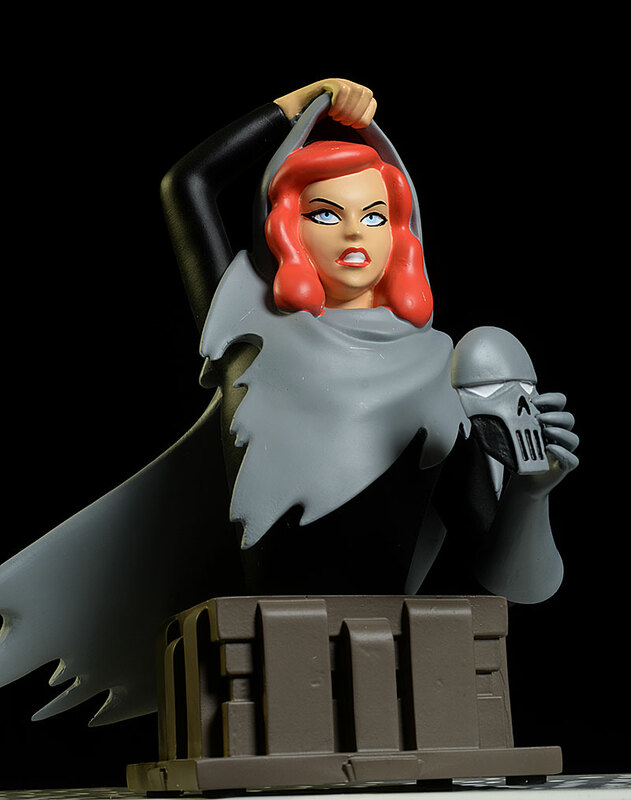 She's pulling back the cloak, holding her mask in her left hand. 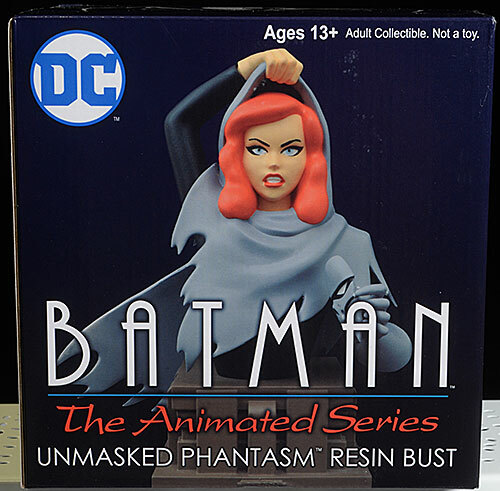 The original design - which you can see on the cover of the box - had the mask being held at a weird angle and in a weird way. Thankfully they corrected that with the final release. There's the right amount of detail for an animated character, which translates to 'not much'. She captures the on screen look well, and the design of the base, drawing heavily from the look and feel of Gotham itself, has always been a big positive. 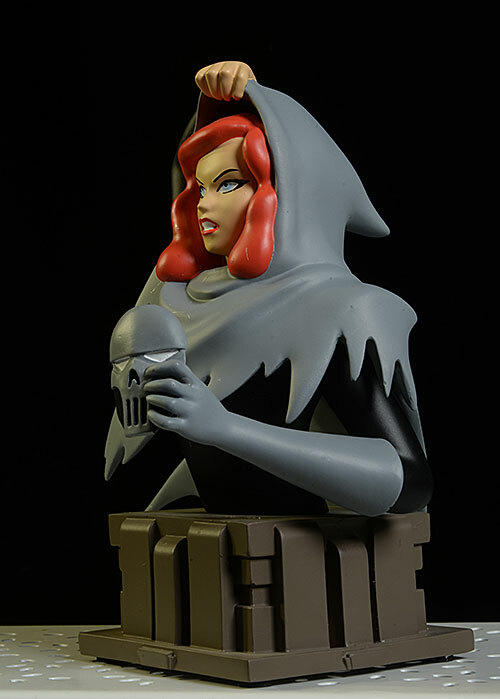 The bust stands about 6" tall overall, fitting in nicely with the rest of the series. Unfortunately, this is one of the sloppier paint jobs I've gotten in this line. You know that's where they are cutting costs, but it's still important to note. Lines are generally fuzzy and uneven, and there's some dirt and crud stuck in the paint in several spots. While colors are largely consistent, the inattention to quality is obvious just about every where you look, from the hair, lips, and eyes on the face, to the eyes of the mask itself. 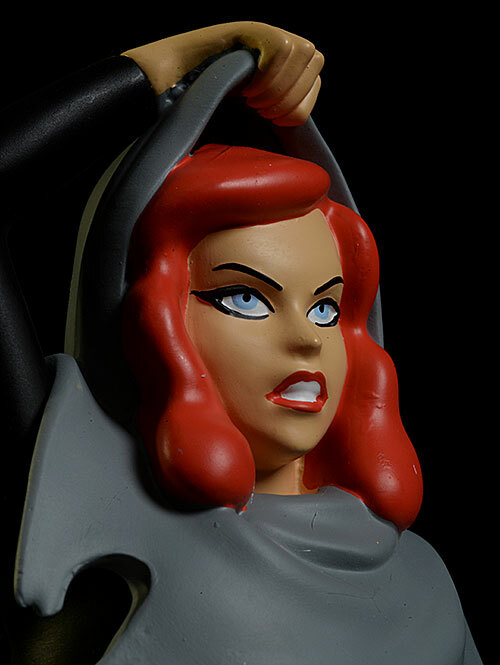 These are just $50, an astonishingly good price for a resin bust of this size on today's market. While you can see where they've cut costs on the paint, it's still a very good value overall. Obviously, if you're picking them out in person you should go for the best paint, but otherwise you should be good to go. I'm sad to see this series end, but every series does at some point. We've gotten some fantastic releases, and the group will look amazing together on your shelf. The paint work was weaker this time around, but it's not surprising with a tail ender, especially one in a budget minded series like this. - has her for $50. 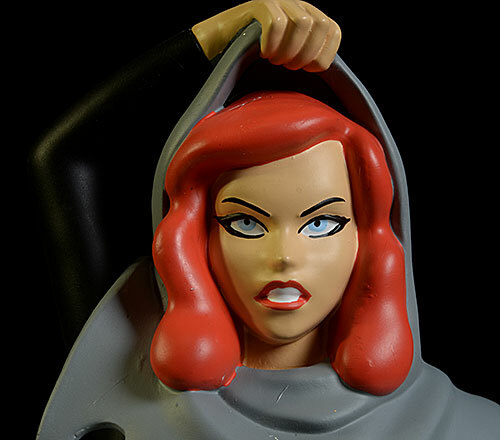 I've covered a number of the BTAS busts, including Ra's Al Ghul, Killer Croc, Clayface, Mr. Freeze, Man-Bat, and Harley.